These are 24″ Diablo Fury Wheels on this Dodge Challenger. Fury wheels have a clean luxurious look. These wheels give this Dodge Challenger an aggressive stance! You want your ride to get all the attention? You NEED Diablo Wheels! Diablo Fury wheels start at 24″ and go all the way up to 28″ . 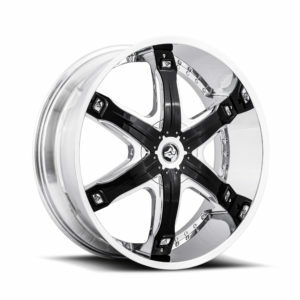 These wheels come in Chrome or Black finish. Custom finish as well as paintable inserts are also an option.